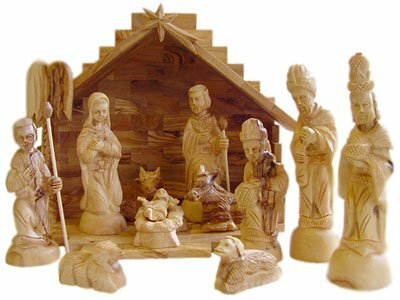 High Quality dry Bethlehem Olive Wood locally hand-carved 12 piece Nativity Set. Stable measures 11 x 9.5 x 8 Inches. Figurines are 4.5' to 6.5" tall. Traditional Style Set. New in Box. Santa's Workshop Christmas Day Carolers Figurine, Set of 4, 20" x 27"